I ran into the always energetic Alexander Grugrich yesterday (at Mars Cafe, of course). 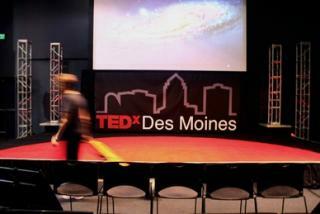 Among the other items in our conversation, he reminded me that the next installment of TEDx Des Moines is coming up on October 13th! I won't be able to attend so y'all have to represent. This is an event not worth missing. It's not just about the speakers, though they form the foundation from which the event springs. TED is really about engagement and inspiration. If you go, use the speakers as a tool for engaging your fellow attendees. You will be with interesting and innovative people all day - don't waste the opportunity!